MG F. K. Mearns became the new 25th Inf Div commanding general during a change of command ceremony at Cu Chi base camp on Aug. 6. He succeeds MG John C.F. Tillson III who has returned to the U.S. to take command of the First U.S. Army, Fort George G. Meade, Md. The ceremony took place in front of division headquarters. MG Mearns comes to the 25th from assignment as director of enlisted personnel, Office, Chief of Personnel Operations, Washington, D.C. He is a 1938 graduate of the U.S. Military Academy, West Point, N.Y. Prior to World War II he served with various field artillery units at Fort Sill, Okla., Fort Sam Houston, Tex., and Fort Lewis, Wash. Shortly after the United States entered the Second World War, GEN Mearns was transferred to the III Army Corps and served as assistant G-3. He then served in the same capacity with the VI Army Corps. In November 1943, he became battalion commander of the 3d Bn, 135th Inf. The general participated in the Sicilian, Naples-Foggia, and Rome-Arno Campaigns. Following World War II GEN Mearns spent nearly four years at Columbia University and in Europe studying the Russian language and the Soviet geographical area. He then served as plans officer and G-3 of U.S. Forces in Austria; in the latter capacity as U.S. representative on the quadropartite Military Committee in Vienna. 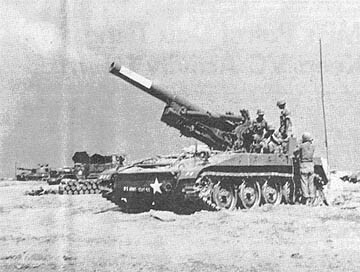 Returning to the U.S. in 1950 and following attendance at the Artillery and Guided Missile School, he commanded successively the 75th Arty Bn, 17th Arty Gp, and 77th Arty Gp. Upon graduation in 1952 from the Armed Forces Staff College at Norfolk, Va., GEN Mearns became the first director, Special Forces Department of the Unconventional Warfare School at Fort Bragg, N.C. In 1954 he was appointed U.S. Army Attache to the USSR and served in that position in Moscow until 1957. Upon return to the U.S. he attended the Army War College, graduating in 1958. Thereafter he served two years as G-3, Sixth U.S. Army in San Francisco. Upon return to Fort Bragg in 1960 and assignment to the 82d Airborne Div., he commanded the Div Arty of that organization and then served as its chief of staff in 1961-62. In November 1962, GEN Mearns became artillery commander, XVIII Airborne Corps at Fort Bragg. He was reassigned to U.S. Army Europe in June 1963, as artillery commander, 3d Armored Div. One year later, June 1964, he became artillery commander, V Corps. 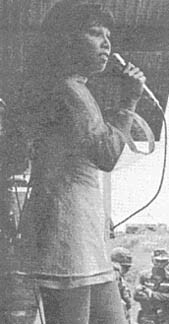 He and his wife, the former Elizabeth M. Boles, have three children, Nancy E. (married), Suzanne, 23, and Robert K., 21. Chief of Staff of the Army GEN Harold K. Johnson made a three-hour tour of 25th Inf Div units Aug. 3 during his eighth visit to Vietnam. GEN Johnson was here to gain first hand knowledge of the current situation. The chief of staff was met upon his arrival at the 5th ARVN Div by MG John C.F. Tillson III, then 25th Div CG. He then traveled to 25th Div Hq at Cu Chi where he received a briefing on operations now in progress within the 25th's area of responsibility. During his brief stay he also visited the 4th Bn, 23d Inf; 4th Bn, 9th Inf; and 1st Bn, 5th Inf. Accompanying the general on his tour were LTC J. C. Kiefe, executive assistant to GEN Johnson, and SGM W. O. Woolridge, sergeant major of the Army. 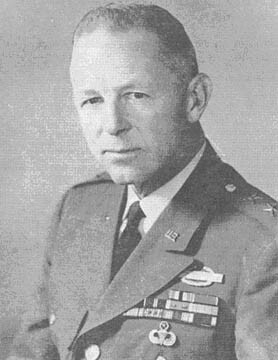 GEN Johnson took over as chief of staff of the Army in July 1964. Prior to then he served as assistant deputy chief of staff for military operations for Plans and Operations, Department of the Army. He is a survivor of the Bataan death march of World War II fame, and was liberated three years later when the 7th Div made their occupational landing at Inchon, Korea. DAU TIENG - After being under the operational control of the 25th Inf Div for more than nine months, the 3rd Bde, 4th Div is now carrying the Tropic Lightning name, as the 3rd Bde, 25th Inf Div. Prior to coming to Vietnam, most of the men of the 3rd Bde were raw recruits, just drafted into the Army. They were sent to Fort Lewis, Wash. where they received basic and advanced individual training. Twenty-two hundred draftees in December 1965 became the core of the fledgling brigade. In Vietnam, the training continued as the brigade first sent out small unit patrols around the Bear Cat base camp. This progressed into company-sized operations, and then to the first multi-battalion operation "Bremerton." Designed to clear Viet Cong out of the Rung Sat Special Zone and also to promote the revolutionary development program in that area, the 3rd Bn, 22nd Inf and Btry C, 2nd Bn, 77th Arty continued their search and destroy mission in the Rung Sat while the rest of the brigade moved the base camp to its present location at Dau Tieng. Since the brigade's arrival at Camp Rainier, November 1966, it has been under the control of the 25th Inf Div in such combat operations as "Attleboro, Cedar Falls, Gadsden, Junction City, Ahina," and "Diamondhead." 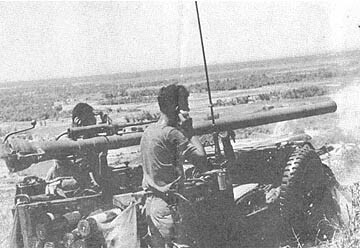 These operations covered large sections of the dense jungle and swampy marshland of War Zone C.
In a single engagement during Operation Junction City, the 3rd Bde decimated the Viet Cong's 272nd Regiment in hand-to-hand fighting at a small fire support base 35 kms northeast of Tay Ninh. When the four-hour battle was over, 647 Viet Cong regulars had lost their lives. The brigade is now responsible for the majority of War Zone C including the Tay Ninh and Dau Tieng base camps and the large expanse of dense jungle north and west of Dau Tieng to the Cambodian border. The 3rd Bde is commanded by COL Kenneth E. Buell and consists of three infantry battalions and one artillery battalion. The 3rd Spt Bn provides logistical support for the large brigade. The 2nd Bn (Mech), 22nd Inf. commanded by LTC Ralph W. Julian provides the mechanized punch for the brigade operations while the two other infantry battalions, the 2nd Bn, 12th Inf, and the 3rd Bn, 22nd Inf, scour the jungles with the thoroughness only the man who is walking, and at times, crawling through the jungle can achieve. The 2/12 "White Warriors" are commanded by LTC James F. Greer, while LTC James E. Hilmar leads the 3/22 "Regulars." Artillery supporting fires are provided by the 2nd Bn, 77th Arty which is commanded by LTC Fred J. Merritt. The main base camp of the 3rd Bde is located in the heart of the Michelin Rubber Plantation. to it, and then let us live up to it and add a new laurel to the crown of America. The U.S. Army is encouraging qualified individuals to apply for military occupational specialties for which the Army has warrant officer requirements. DA Circular 601-13, dated 22 June 1967, lists 35 specialties for which warrant officers are needed. The circular authorizes retired warrant officers to apply for active duty and further provides for granting waivers of maximum age and service limitations. Reserve warrant officers holding any of the listed specialties may apply for active duty. Enlisted personnel who possess the required qualifications may apply for appointment as warrant officer (W-1) with concurrent call to active duty. Helicopter pilot, utility and light cargo single rotor; meteorology technician; field artillery radar technician; field artillery missile system technician, PERSHING; field artillery missile system technician, SERGEANT; air defense missile assembly technician, NIKE; air defense missile fire control technician, NIKE. Also, air defense missile system technician, HAWK; field artillery missile system repair technician, SERGEANT; field artillery missile system repair technician, PERSHING; air defense missile system repair technician, NIKE; air defense missile system repair technician, HAWK; communications-electronics repair technician; fire distribution systems repair technician; armament repair technician. Also, ordnance shop technician; utilities maintenance technician; master or mate; marine engineering technician; engineer equipment repair technician; automotive maintenance technician; automotive repair technician; unit personnel technician. Also, legal administrative technician; cryptographic technician; data processing technician, EAM; unit supply technician; photomapping technician; survey technician; map reproduction technician; food service technician. Speaking about his observations of U.S. soldiers in Vietnam, Secretary of the Army Stanley R. Resor has said he found a prevailing "can-do" attitude and a sense of purpose and dedication that was most impressive. This "can-do" attitude of U.S. Army personnel serving in Vietnam clearly reflects a "duty-first" attitude. In defining DUTY, Webster's Dictionary calls it "the action required by one's position or occupation" and "a moral or legal obligation." But "action required" is not enough. Duty also means the desire to do more than just the basic task, to carry a job through, to see that every detail is complete. No soldier should feel that the "duty-first" attitude is limited in Vietnam. Whether serving in the United States, Europe, Korea or anywhere the U.S. Army maintains free-world security, the extra time and effort a soldier puts into a thorough job demonstrates the "duty-first" attitude being shown in Vietnam. General Harold K. Johnson, the U.S. Army Chief of Staff, has said, "We should show our pride in our comrades there (Vietnam) by doing our tasks with equal diligence and by standing ready to acquit ourselves as they do." The feeling of unit pride and individual self-satisfaction gained from a job well done is the true mark of "duty-first" soldiers. Would you believe that about 15,800 allotment checks and bonds are being returned to the Finance Center, U.S. Army every month because they cannot be delivered at the addresses printed on them? This means that many individuals (members and dependents) are failing to notify the Finance Center when they move. Are you one of these? Since it takes quite some time to process and remail these checks and bonds, delays in receipt can be lengthy. When you fail to notify the FCUSA of a change of address, your dependents could endure hardships because of late receipt of the allotment check. Also, you may lose interest on your savings account because of late delivery of class E allotment check for savings deposits in commercial banks. In any case, you and your dependents should remember -- to insure timely receipt of allotment checks and U.S. savings bonds, furnish your new address to FCUSA immediately. With each check or bond being sent overseas, a self-addressed change-of-address card is included. Checks or bonds mailed within CONUS will include the same type self-addressed change-of-address card every third month. These cards can be used at any time to notify the Finance Center of a new address. When there is no change-of-address card available to either you or your dependent, a letter or post card can be sent to the Finance Center, U.S. Army, ATTN: Allotments and Deposits Operations, Indianapolis, Ind. 46249. HONOLULU - A new offshore catalog is being developed by Headquarters PACEX for use by Exchange customers in the Pacific. The catalog will primarily contain some 200 high demand items of offshore origin which have been found in the past to be popular with the troops as principally souvenir items. The old offshore catalog, popularly referred to as the "JAKOR Catalog" will be replaced by this new one as soon as sources for the items are developed and the catalog is printed and distributed in sufficient quantities. During the interim period orders will continue to be filled through the JAKOR Mail Order Section from the current catalog. Since the new catalog is designed to duplicate items in the Southeast Asia stock assortment, (primarily for Vietnam and Thailand) orders from the catalog will be accepted for delivery from APOs to CONUS addresses only. The new catalog will be distributed to individual customers in Vietnam and Thailand, and will be available at most customer service counters throughout Pacific Exchange System main outlets. In smaller Exchanges, catalogs will be available at managers' offices. DUC PHO - Working with entrenching tools, a flashlight and armed with .45 cal. pistols the "Tunnel Rats" made trip after trip into tunnels searching for Communist guerrillas and equipment. After a long day of digging and probing the banks of a small stream near Duc Pho, the "Cacti" platoon had searched seven tunnels, killed six VC, captured three weapons, five detainees and numerous hand grenades and ammo. "We moved in here purely on an educated guess," said 1LT John G. Denino. "We had been receiving sniper fire from this location so we decided to make a thorough search." Dividing into search teams, the 3rd Pltn, Co A, 2nd Bn, 35th Inf, set about the tedious mission of hunting the entrenched enemy. "The area was full of spider holes and tunnels," related PFC Andrew MacGregor of Brooklyn, N.Y. "We had to search them all and many were hard to find." Most of the tunnels were along the banks of a small stream. The entrances were well camouflaged behind bamboo and dense vine thickets. The infantrymen cautiously probed each thicket looking for a path which might give away the location of the entrance. A door made of either sticks or boards covered by dirt and grass concealed the exact location. It was mid-morning when MacGregor and PFC Herman E. Bowers of Mt. Vernon, Tenn., discovered a worn path leading into a bamboo thicket. The duo had barely started digging when they hit the sticks covering the entrance. As one stick was removed, PFC Gearld McAfee of Tulsa, Okla., who had joined the pair, caught a glimpse of a weapon muzzle. Rifle fire tore into the entrance followed by grenades. Next PFC Benjamin Chavet, a tough little soldier from Van Nuys, Calif., and the platoon's ace tunnel rat, went to work searching out the tunnel. Three VC were killed and three weapons captured. However, the day was just beginning. "Keep searching, there must be at least a squad," was the order from Denino. The search teams once again set about the hot and tedious task. Probing the bamboo thickets again proved fruitful as another tunnel was discovered. Again the call went out for Chavet. Although the VC had abandoned the tunnel, grenades and new boxes of ammo were captured. Moments later another tunnel was located. Quickly the men sprang into action. This time it was occupied. As a grenade was hurled from the entrance the men dove for cover. Rifle fire drove the VC from the entrance and grenades were tossed in. Three VC, web gear, and grenades were taken from the tunnel. Not more than 15 meters away still another tunnel was found. Very little time was wasted as each man knew his job. Chavet was ready to enter the tunnel when he was really surprised. Someone started crawling from the entrance. Chavet jumped back with his pistol cocked waiting to see if he was armed. Unarmed, the man was followed by four more. The platoon now had five detainees. A chopper was called and the five were lifted to the forward tactical command post of the 3rd Bde, 25th Inf Div, where they were subsequently classified as Viet Cong. It was quite a day for the 3rd Plt. Accounting for more than a squad of guerrillas they certainly lived up to the B's motto "None Better." Soldiers of the 25th Div's 2nd Bde scratched their heads in wonder recently as a armored personnel carrier (APC) from the 1st Bn (Mech), 5th Inf, went flying overhead. The carrier had hit a Viet Cong mine the day before. Removing it from the swampy lowlands along the Oriental River would have meant dragging it 15 kms to the nearest road for pickup. The only answer was to fly it out, but the APC weighs 13 tons. Battalion officers figured that it would take 13 HU-1D helicopters pulling at once to lift it out. The answer came flying into the unit's forward base in the form of a giant "Skycrane" helicopter. The huge ship can easily lift a nine ton load. To meet the weight restriction, the carrier's tracks were broken, and the vehicle literally driven off its metal treads. Then the engine was removed and all radio equipment was stripped off. 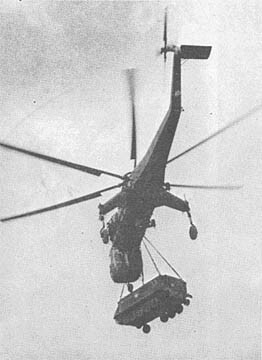 Two soldiers battled the 120 mile an hour rotor wash and hooked the cargo straps to the Skycrane's hoist hook. Everyone stood back and watched as track number 33 flew off toward Cu Chi. 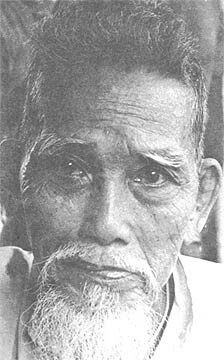 DAU TIENG - He was wearing a sock full of C-rations across his chest, a bed roll high on his shoulders, and two canteens on his hips. The VC opened fire from 15 feet away. They put a bullet through the bottom of the lowest C-ration can, piercing all the others, and coming out of the top of the last. Bullets pierced both his canteens. His bed roll was shredded. 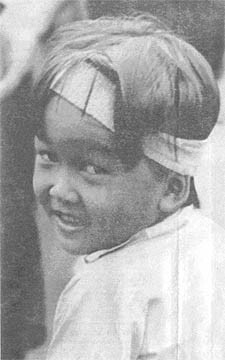 His wounds: minor cuts on his chest and face from the exploding C-ration cans. The soldier was 1LT Henry Sterbenz of Glendale, N.Y., commander of the 3rd Bn, 22nd Inf's Co. B, during the 3rd Bde, 4th Div's Operation "Diamondhead." The ambushers got away, but somewhere a Viet Cong is mumbling to himself and shaking his head in wonder. Sterbenz led his company back into Camp Rainier in the afternoon rain. DUC PHO - There will be two less weapons shooting at the 1st Bn, 35th Inf, because of two Hoi Chanh. Recently the two former Viet Cong surrendered themselves to the Duc Pho District Headquarters. They said they each had a weapon and were willing to lead American troops to where the rifles were hidden. With the assistance of an interpreter, the ralliers led Co A, 1/35th, directly to the cache. The infantrymen uncovered two MOS 36 bolt action rifles. Jewish Church Services are now being conducted at the Division Memorial Chapel. Regularly scheduled services are held on Friday at 7 p.m. and Saturday at 9 a.m.
A new, curious and vital generation of Vietnamese is personified in the form of Nguyen Van Trieu, the progressive village chief of Cao Phu, an Ap Doi Moi (Real New Life Hamlet) 55 kms northwest of Saigon. 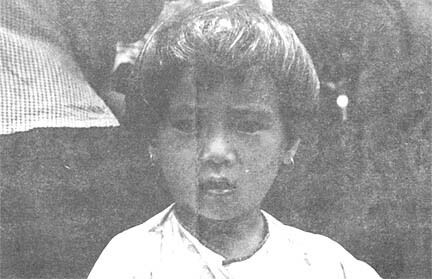 Most of the 3000 villagers of Cao Phu have been resettled from Viet Cong dominated areas. They have attained the Ap Doi Moi status by scoring higher than 70 per cent on the Revolutionary Development (RD) Team's "98 points." Other possible designations on the RD scale - Ap Binh Dinh, Ap Tam Sinh, Ap Cung Co - indicate the villages have not yet reached their potential. 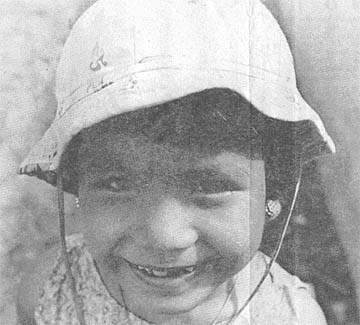 The basic Ap Doi Moi qualifications are these: Elimination of Viet Cong influence and corruption in both political and social status; establishment of sound local government; provision for self defense; improvement of literacy and sanitation; implementation of land reform along with development of agriculture and handicraft industries; improvement of communication; and recognition of deserving soldiers, public servants and citizens who have participated in Revolutionary Development programs. Trieu has worked closely for the past few months with CPT Edwin W. Richardson Jr. of Perris, Calif., civil affairs officer for the 4th Bn, 9th Inf, 25th Inf Div. Richardson feels they have come to trust and understand each other. Over a late lunch in Go Dau Ha one afternoon they discussed various self-help projects and the role Richardson might play in the increasing development of Cao Phu. By the time the table had been cleared, tentative plans for a rabbit farm had been made, the Cao Phu library was a step closer to reality, and the idea for a weekly newspaper had appeared. Richardson told Trieu, through SGT Thanh the interpreter, that he was attempting to get textbooks for the school. Though Trieu is still a young man, he is fully aware of his position and responsibility. The village chief is appointed by the Village Administration Committee (VAC) the governing body of the village. DUC PHO - The night began like an ordinary night for the Recon Plt. of the 1st Bn 35th Inf. Late in the night, two unsuspecting Viet Cong were spotted moving toward the well-hidden ambush. Anxious moments passed until the enemy was trapped. The infantrymen opened fire and instantly killed the two guerrillas. A search of the area produced two pistols and several documents. 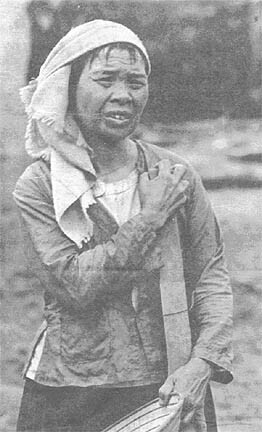 In the night-blackened jungle outside Tan Phu Trung, the four men of the ambush patrol were crouched and waiting; intelligence reports indicated that VC would pass this way returning to their village where they would spend the night with their families. The VC appeared suddenly, moving silently through the jungle, sometimes coming within inches of the concealed ambushers. At this time, a cough, a sneeze, a slight movement by any member of the patrol would have meant death for himself and his comrades. When the last VC had passed a few feet beyond their position, the squad opened fire. Two VC were killed instantly and the others - at least eight VC were involved - fled leaving a trail of blood behind them. 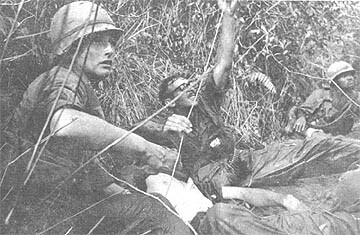 The patrol which routed the VC was composed of one American, one ARVN and two Popular Forces soldiers. Recalling how close he and his men were to the VC that night, SSG Alfred Knopsnyder of Markleton, Pa., 2nd Bn, 14th Inf, says, "I couldn't move my rifle for fear of bumping one of the guerrillas." About the success of the patrol, the sergeant had this to say: "In the dense vines, and bushes of the jungle, the only way for the enemy to discover a concealed soldier is to directly stumble over one. That is why the well-concealed and planned ambush is so effective." The villagers of Ap Mui Len in Quan Nghia Province are using the material and technical assistance made available through the 25th Div's Self-Help Program to build an addition to their school. The school serves the rice-rich countryside just south of the district seat of Cu Chi. The children presently attending classes range in age from 6 to 12. The structure, now about two-thirds finished, will double the capacity of the school when completed. The teachers are anxiously awaiting the finished product because of the overcrowded conditions in their classrooms. To get the project off the ground, 1LT William Henderson of Everett, Wash., civil affairs officer of the 25th Supply and Trans Bn, first obtained the cooperation of the people in the hamlet. Then arrangements providing for new teachers were made with the Provincial primary education chief who is comparable to a superintendent of schools in the United States. In the past, S-5 officers have had the problem of building schools and then not being able to provide teachers. "This tended to irritate rather than please the people," said Henderson. "That is why the procurement of teachers is high on the priority list," he explained. Henderson stated, "The materials are made available at little or no cost, but the people must involve their own time and labor. By making them provide that, they take more pride in the improvement and are less likely to let it be abused by anyone, VC included." SP4 Warren Lee Holton and SP4 Stanley J. Domian have been named Soldiers of the Month for the 25th Supply and Trans Bn, for the months of June and July, respectively. The men were picked to represent their companies in battalion competition on the basis of their past records and present performances. Each was then chosen as Soldier of the Month on the basis of his performance before a question and answer panel of Senior NCOs. DUC PHO - A small breather hole in the side of a rice paddy dike was the first sign "Charlie" was in the area. LT Homer Krout II, platoon leader of the Recon Plt, 2nd Bn, 35th Inf, immediately established a perimeter and began searching the area. Conducting an early morning combat assault, the Recon Plt was following an agent who said he could lead them to a tunnel complex. Arriving at the location it appeared that the agent was mistaken. "At first we couldn't find anything. Then one of my men saw the breather hole,"
The Recon men began to enlarge the hole. Suddenly, four grenades were hurled from the tunnel. Diving for cover, no one was injured. The ensuing fight resulted in eight enemy killed and four weapons captured. Next, the Vietnamese agent reported that he knew where another tunnel was located. "We arrived in the area but were unable to find a tunnel," stated Krout. "We were ready to give up the hunt when the Vietnamese agent became suspicious of a basket with bamboo shoots growing from it. He moved the basket and revealed the entrance to a tunnel." A search of the area revealed an empty tunnel. As the choppers were coming in, two VC sprang from a spider hole next to the LZ. Throwing grenades at the infantrymen they attempted to escape across a rice paddy. Surprised, the infantrymen whirled around and ended the escape attempt. DUC PHO - Infantrymen of the "Tropic Lightning" 3rd Bde, conducting search and destroy operations southwest of Duc Pho captured what was believed to be a small booby trap factory. The VC working in the small shop were evidently surprised by the U.S. soldiers and abandoned the area and their equipment to avoid contact. The "Cacti" of the 1st Bn, 35th Inf, were searching an area of constant enemy activity when a concealed trail leading into heavy underbrush was located. LT Roger G. Ladd, the platoon leader, ordered his men to search along the trail. The infantrymen did not go far when they found a small "hootch" and the necessary equipment to construct booby traps and grenades. The find included fuses for grenades, a container full of small pieces of metal to be used as shrapnel, gun powder, commo wire and 18 rounds of .30 cal. ammo. Also found were parts of weapons, two tons of rice, documents and maps, and a sight for an anti-aircraft weapon. Although the enemy had fled the area, the confiscation of the bobby trap material may well be more important. Booby traps, planted with devious ingenuity, have plagued the infantrymen since arriving in Duc Pho. 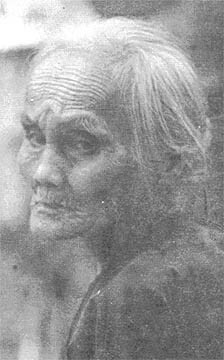 A 70-year-old Vietnamese farmer, tired of being taxed by local Viet Cong, led a U.S. Infantry patrol to five tax collectors. The patrol, from the 4th Bn, 9th Inf, were in a daylight ambush position eight kms northwest of the 25th Inf Div's base camp at Cu Chi, when the sound of someone sloshing through a rice paddy alerted them. An old man was spotted approaching the ambush site, and as he neared, one of the men stepped out and halted the farmer. As the squad neared a rice paddy, they were spotted by five VC. Two of the enemy took off running - the infantrymen were unable to shoot because of the farmers working in the surrounding paddies, and they escaped. They did succeed in capturing the other three. Although they got three prisoners, the two that got away were carrying all the money. History was made recently when MG John C. F. Tillson III, announced that the division's artillery units were chosen as the first units engaged in combat to be equipped with the Field Artillery Digital Automatic Computer (FADAC). "I share with my men the pride of being first," COL David E. Ott, 25th Div Arty commander, stated upon hearing the news. 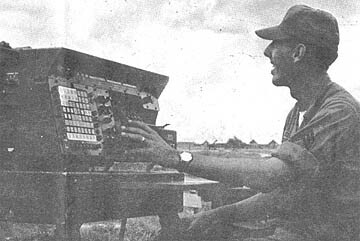 The outstanding feature of the computer is that it automates all fire direction computations, allowing computations for a mission that take about two minutes by the present manual method to be made in twenty seconds with extreme accuracy. FADAC's versatility is apparent in its ability to allow one computer to control five batteries or fire units, firing multiple missions with two different weapons such as 105mm and 155mm pieces and from memory, furnish information for first round target hits without registration. All firing batteries and battalion headquarters will be issued FADAC immediately. The cost to equip these units is the same as paying for 36 armored personnel carriers (APC). It is considered well worth it by the artillery men. 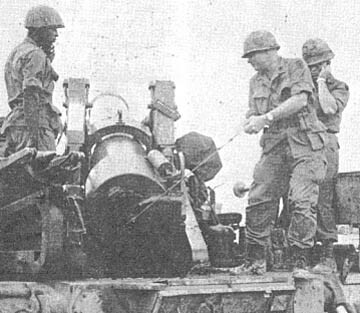 Also in another historical event at the 25th Inf Div's Cu Chi base camp, COL Ott pulled the lanyard on one of Btry D, 3rd Bn, 13th Arty's, 8 inch guns, firing, as he had earlier stated, "the first round fired in anger at an enemy, using data supplied by FADAC." The mission was harassment and interdiction with the target a trail junction known to be well used by the enemy. Every one present for the firing and demonstration was amazed at the speed and accuracy of FADAC in furnishing adjustment information. "It completely revolutionizes fire direction procedures," CPT Curtis L. Lamm, commander, Btry D, 3/13 Arty, said as he viewed the computer in operation. The computer is powered by a practically weatherproof gasoline generator that even withstands monsoon rain torrents. Two generators are issued to insure continuous operation. Battalion maintenance personnel get two pieces of equipment for periodic testing of the FADAC's to keep them in tip-top working condition. These are the signal data reproducer, which is also the computer's memory loader, and the computer logic unit test set. These machines can determine the very smallest adjustment that may be necessary to keep a FADAC operating perfectly. A little girl with two brothers in the military service took to the streets selling dandelions in Manchester, N.H., recently so she could buy American flags to send to troops in Vietnam. Nancy Ann Hobbs, 7, had received a letter from her brother in the Marine Corps stating he would like a U.S. flag for his unit. Nancy's efforts in trying to raise money for a flag received a lot of local publicity and she eventually had donations totalling $25. A local Army recruiter who had enlisted one of Nancy's brothers in the Army suggested that the flags be sent to the 25th Inf Div, his former unit. The suggestion was adopted and the small U.S. flags are presently being distributed throughout the command. DAU TIENG - By nine o'clock in the evening, the streets of Dau Tieng are deserted. Light flickers from the little huts and houses that line the hard-packed dirt streets. Occasionally, a dog goes running after some of the chickens who are still scratching at the ground for an occasional snack. If a person has to leave his house at night, he must carry a lantern - not a flashlight. At ten, eight men are ready to go. They carry only their weapons - grenade launchers, M-16's and 45's, ammunition, and instead of the steel pot, they wear soft caps. It is a small, professional squad carrying just the essentials for a patrol - well-armed but not slowed by too much equipment. There is a dog with them - highly sensitive and alert. If action comes, they will be ready. To those of us in Vietnam, the squad described above has all the earmarks of a Long Range Reconnaissance Patrol. Long hours of training and experience mold the patrol into a single unit. However, the soldiers above are not members of a LLRP, in fact, they are not even infantrymen - they are a squad from the Military Police Platoon stationed with the 3rd Bde, 25th Div, in Dau Tieng. Their mission, however, is similar to that of the long range patrol. Each night, a squad of Military Police moves from Camp Rainier into the village of Dau Tieng on a town patrol. 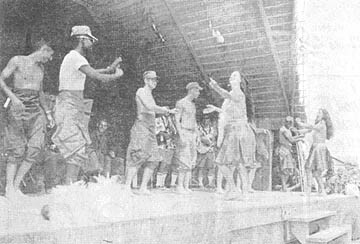 After checking the positions of the ambush patrols which are set each night by the brigade and also by the Popular Forces in the village, the squad moves through the town, alert for Viet Cong activity, curfew violations, or the occasional soldier who has decided to slip through the wire of the camp and go into the off-limits village. On most occasions, the MP's are accompanied by Popular Force troops from the district outpost. Dau Tieng at night is still far from being a safe place for a little stroll, but the town patrol helps to make it a little safer than before. 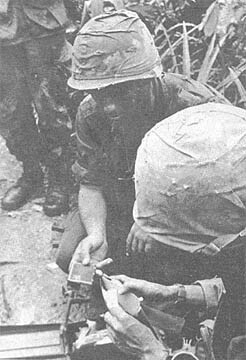 The 25th Infantry Division Information Office is presently compiling material and photographs of all division activities from 1 October 1966-1 October 1967. Anyone having good color, black and white, or color slide photographs of combat, civic action, or any other division activities, please bring them to the PIO and give them to LT Rottmann or PFC Hairston. If you desire, the photos will be returned, unharmed, after they are copied. Also any interesting sketches in pencil, ink, or water color can be used. 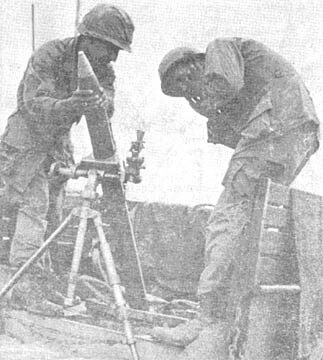 A sharpened bamboo pole has become standard equipment for men of the 1st Bn (Mech), 5th Inf, and the results have been enough to make a VC supply expert cringe. The Viet Cong frequently hide ammunition and weapons in containers sunken into the mud along the Oriental River, northwest of Saigon. The 25th unit makes use of needle sharp bamboo poles to probe for the material.